All my friends are eating paleo nowadays – well many of them are. Some of them are on Paleo because they are doing intense workouts – Paleo is protein heavy – others are doing it for health reasons – it’s a very clean diet for those who have gastro-intestinal issues – yet others are just jumping on the bandwagon because its fashionable. I don’t fit under any of those categories – I just want to be able to cook a variety of types of cuisines, and since I have friends who have a strictly regimented diet I want to be able to make something they can eat. 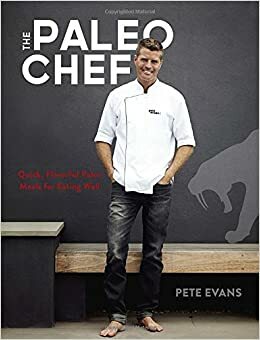 In The Paleo chef – Pete Evans – gives us a fantastic cook book full of gluten free, grain free, and dairy free meals that are Paleo as well. Paleo cuts out processed sugary foods and replaces them with proteins, fats, fresh veggies and fruits, and nuts and seeds. You would think that this limits your possibilities for making great meals. But it doesn’t! And there is a whole collection of drinks too! What I loved about the book was that all of the meals were “sophisticated” but also real. They all look like you put in a ton of effort but they are a cinch to prepare. Over the last few weeks I have been preparing meals out of this book and they have all been hits! They ingredients are quite simple, the directions are easy to follow, and the pictures are exquisite. I love this cookbook! Next Next post: Fear & Loathing In… God?